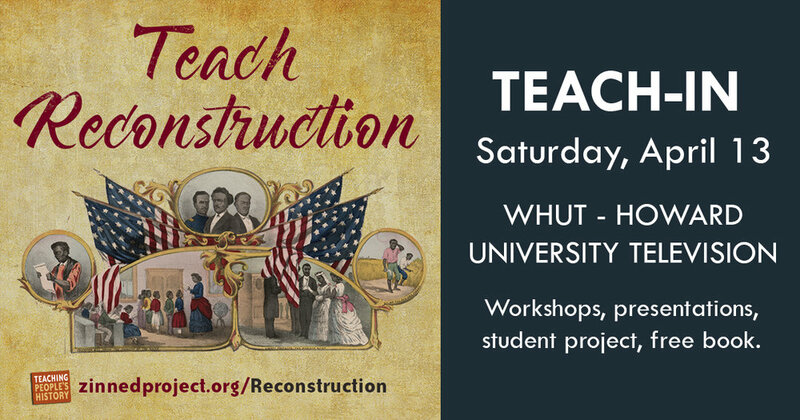 Join the Howard University School of Education, D.C. Area Educators for Social Justice (a project of Teaching for Change), and the Zinn Education Project on Saturday, April 13 for a teach-in on Reconstruction as part of the Teach Reconstruction campaign. The teach-in includes hands-on workshops with lessons on Reconstruction that can be used in middle and high school classrooms, presentations on key aspects of Reconstruction history with a focus on education and the Golden Era of Black political participation, and an introduction to a student project to identify and give visibility to Reconstruction sites in the D.C. area. WHUT (Howard University Television) will present a 20-minute clip from the new four-hour documentary series, Reconstruction: America After the Civil War by Dr. Henry Louis Gates Jr. The film will be introduced by Dr. Edna Greene Medford be followed by an interactive conversation led by Howard University’s Dr. Gregory Carr. WHUT is generously sponsoring lunch for participants. Presenters include Howard University History Department Chair Dr. Nikki Taylor, Howard University Department of Afro-American Studies Chair Dr. Gregory Carr, and high school teacher and Zinn Education Project curriculum writer Ursula Wolfe-Rocca. Each teacher participant receives two free books for the classroom on Reconstruction and a certificate of participation. There are two options for the day as outlined below. Please complete the form below and submit payment (early bird registrations in advance of March 30) to reserve your space in the Reconstruction Teach-In to be held Saturday, April 13 at WHUT - Howard University Television. Please note that this event is for classroom teachers, administrators, other school staff, and pre-service teachers. 20-minute clip from the new four-hour documentary series, Reconstruction: America After the Civil War by Dr. Henry Louis Gates Jr. The film will be immediately followed by an interactive conversation led by Howard University’s Dr. Gregory Carr.